ConnectSx provides full visibility into your device data – simplifying inventory management, expiration date tracking, critical knowledge delivery, and surgical case management. What Can ConnectSx Do for You? As the web-based command center of the ConnectSx platform, the Console gives device manufacturers and distributors full visibility and total control over surgical caseloads and device inventory. A mobile inventory app designed to make sales reps and hospital supply managers more efficient, vTrakr makes it easy to track and manage medical device inventory in real-time. Our flagship surgical app, vTray, leverages a patented approach to deliver device-specific knowledge and procedural instructions in the operating room – making surgical teams more effective. Simplify the way you scan, track and manage unique device identifiers with UDidentify, our free mobile app that turns your smartphone into a UDI barcode scanner with instant access to device data. ConnectSx gives device manufacturers full visibility from the warehouse to the field – providing real-time insights to help you manage inventory more efficiently, while reducing waste and errors. ConnectSx helps device distributors extend the effectiveness of your sales team with an integrated solution for managing surgical cases, inventory, and product details from each manufacturer. ConnectSx simplifies sales reps’ daily workflows with mobile inventory control, case management, device education and billing – helping accelerate payments while reducing administrative hassle. ConnectSx provides real-time access to device inventory, usage, and procedural techniques to help minimize delays, errors and waste in the OR – promoting smoother surgeries and improved care. The healthcare status quo is unsustainable. Under pressures of price compression and increasing regulation, healthcare providers and manufacturers must improve the quality of care while lowering costs for patients – without adding extra admin hassle. Leveraging our clinical and technical expertise, we designed ConnectSx to achieve these goals through one intuitive, innovative platform. By connecting siloed data and managing device knowledge throughout the entire supply chain, ConnectSx helps prevent errors and delays, reduce waste, improve inventory visibility, and increase efficiency. 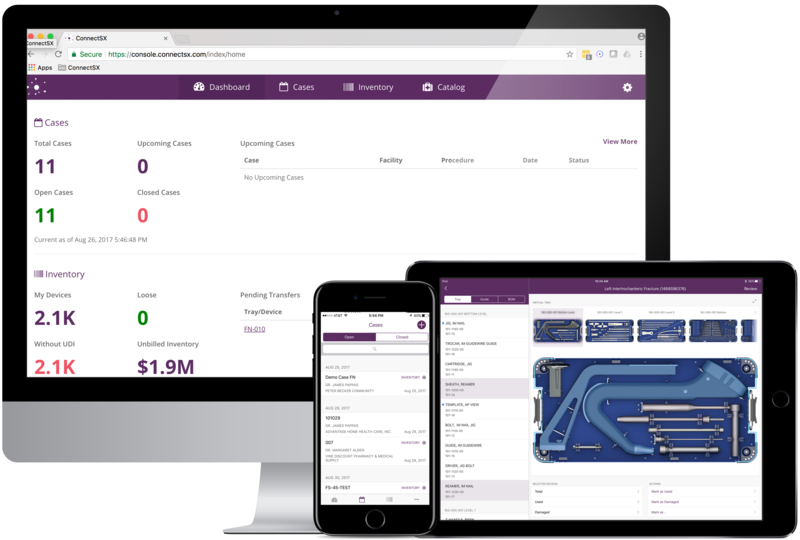 Our tools simplify complex workflows for medical device manufacturers, distributors, sales reps and the surgical teams they serve – potentially improving patient care and reducing healthcare costs through supply chain management. Stay up-to-date with news and releases, delivered to your inbox!